Fall is just around the corner, and with it comes the two hardest seasons the manage landscaping on larger estates. Fall is the last chance to break ground on any projects, cleaning up leaves, and performing triage on the various plants to help them survive the cold. Winter is a balancing act of winterization, snow and ice management, and planning out new projects for when the ground thaws. This blog is going to look at how a landscape estate management team can work with you to get larger estate landscapes ready for these two seasons and maintain them throughout the year. Fall brings beautiful vistas to New England with the changing of the season – namely the changing colors of the trees. And while that is beautiful, the fallout from that on a larger estate with many trees is a large project. Maintaining the grounds throughout fall is a full-time project. Leaf Management: Larger estates mean larger lawns, wooded areas, and even an orchard or two. To best keep acres of ground clear of leaves, you’ll want to bring heavier machines and manpower. Ground Maintenance: Everything from placing down new mulch to pruning and planting for the season. Learn more in our blog, What to Do to Have Your Lawn and Garden Ready for Fall. Landscape Construction: If you want to get any projects done before the ground freezes, fall is your last chance. Make sure to know what goes into a landscape construction design/build project, including how long it takes. In winter, it’s a race to make sure your grounds are ready, from winterization to planning out holiday decorations. Make sure you’ve got the help you need on hand. 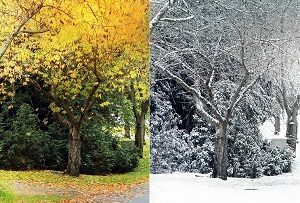 Winterization of Grounds: The cold, snow, and ice can do bad things to your installations. Build a checklist of everything that needs to get ready for winter, from patios to gardens. Make sure your lawn irrigation is winterized, or you’ll be looking at damage in spring. Snow and Ice Management: A New England Nor’easter can play havoc with your plans. Make sure to have a snow and ice management company on standby for when the big one hits. Seasonal Displays and Lighting: If you’re going to be the host for the holidays this year, make sure you can do it in style. Learn how season displays can take pressure off your own staff. Planning for Spring: Winter is no time to build, but it is a time to design. Get a head start on landscape construction by talking with your design/build contractors in this season. At Greener Horizon, we provide full estate management services, from top-level landscape design and master planning, down to the details of plant health care. We work directly with clients to get your landscape to peak performance, and then maintain it throughout the year. In addition, we provide consultation and designs for further enhancing the beauty of your landscape. All of this together is the goal of estate management: to provide curb appeal to your home and convenience to you. Let us walk through the parts of estate management and contact Greener Horizon today.